You are here: Home / APPETIZERS / Pesto Pasta Bites! This recipe for Pesto Pasta Bites is one of the first things I learned to make that didn’t come from my uber talented family. When I moved to California from the Midwest after college I pretty much stuck to all the things that I ate when I was growing up. If I made food at home Id make their recipes, although thinking back on it I’m pretty sure I went out for dinner a LOT when I was first out here. Then I met Brenda who happened to be from my home state of Nebraska, coincidentally from a town very close to mine. We were destined to be friends and when we looked back at how often our paths had crossed we were surprised at how long it took us to meet. I think its funny we both had to move to California to become friends! I drove out to her house one night and she made this Pesto Pasta recipe. I remember taking a bite and asking myself why have I never had this before. The pesto was made with all fresh ingredients and it tasted sooooooooooo good. And the bonus? She made it while we sat and talked for 15 minutes and drank wine. Yes, you can make this from start to finish in the time it takes to cook the pasta. That’s a winner in my book any day. This Pesto Pasta Bites recipe changed my life. It was the first time that I wanted to cook versus going out to eat. 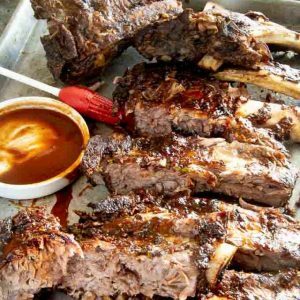 Although my mom, dad, and grandmothers were great cooks in the kitchen, this recipe was the one that made me want to make new and different things. 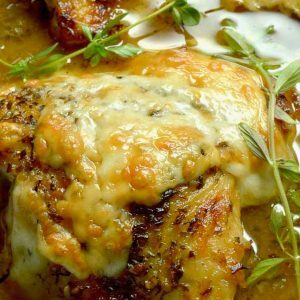 I’ve served this various ways over the years both hot and cold, mostly with basil and walnuts. (Brenda’s original recipe called for pine nuts) but in a pinch you can sub any nut and other greens such as arugula, spinach, parsley…. the possibilities are endless. I love that a simple dish can be served for a regular weeknight dinner or can be presented in a way that makes it seem super special by swirling it on forks and serving it on a pretty platter. Easy/Hard: Start water to boil, make pesto, boil pasta, mix. All finished in the time it takes to make the pasta! EASY! Make Ahead: Absolutely, this dish can be warmed up easily, but also works great at room temperature! 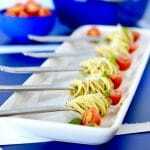 Serving Suggestions: Bring this Pesto Pasta Bite recipe as a potluck contribution, serve it as the main course with a simple salad or serve as I have pictured swirled on forks as a filling appetizer at a cocktail party! Cocktail Pairings: This pasta works well with any crisp white wine such as a Pinot Gris, or a lighter chardonnay (ask for one that doesn’t have a lot of oakiness in it.) Ive also served this with a Pinot Noir and loved it. The basil and garlic pair well with that. 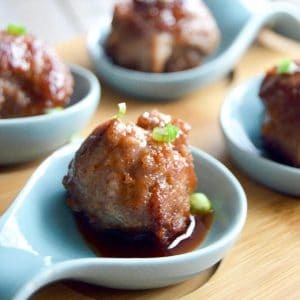 This would also pair well with the Sakitini Cocktail! What is the SECRET TRICK to these Pesto Pasta Bites?? SECRET TRICK: When you drain the pasta, save about 1/2 a cup of the pasta water. When you are mixing the pesto with the pasta drizzle a little bit of that pasta water into the pan with the pasta and pesto sauce~~~ it helps make the pesto coat evenly to the pasta! 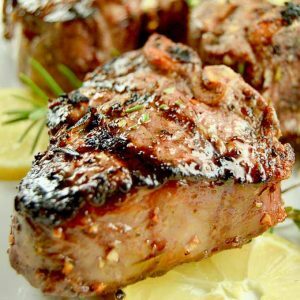 Follow Me on Pinterest for more easy recipes that work well for social get togethers! 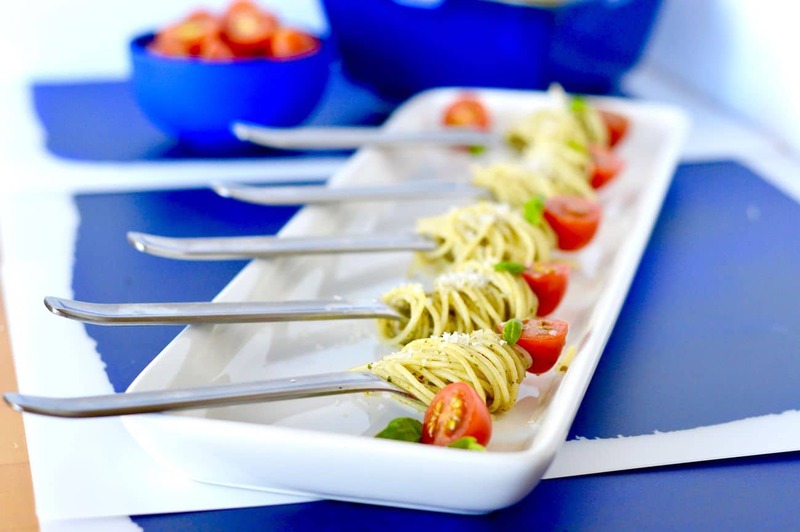 To serve on forks, swirl pasta around forks and place in a row on a serving platter. 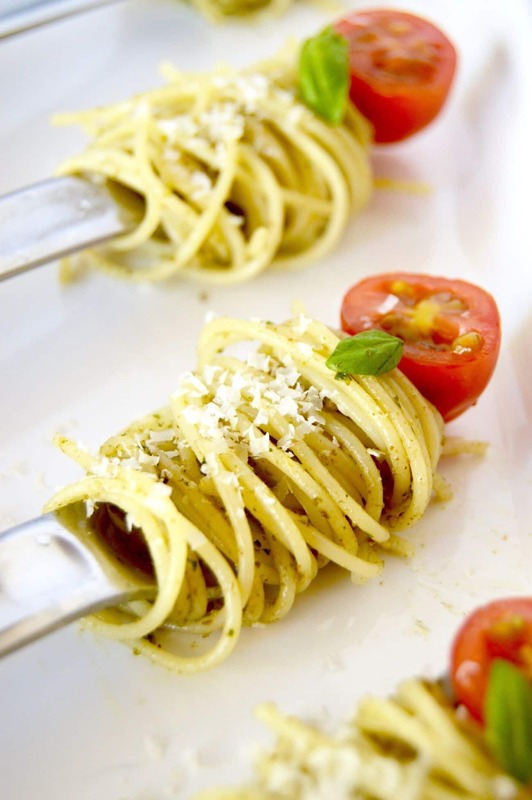 Garnish with Parmesan cheese, small basil leaves and tomatoes. 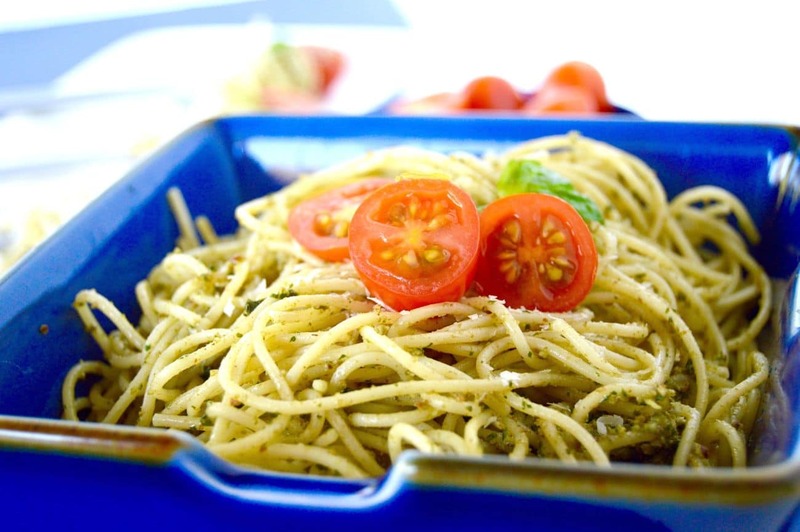 If serving as a pasta meal, put pesto pasta in serving bowl, sprinkle with parmesan and place a couple of tomatoes and basil leaves on top and serve. This dish works great at room temperature or hot! I made these for a bridal shower…. So many people love pasta but don’t eat much carbs anymore. THis satisfied most of us by getting just a few forkfuls! Welcome to Yum Goggle! We are following you on all social media platforms and hope you will follow us back. We will do our best to tag you each time we promote your posts Kelli at YG! I’m happy to make your day! One of the other bloggers said YG is like coming to a family store where everyone knows you and you won’t be judged………We like to be inclusive instead of exclusive – that way more people get to see all the great recipes we have! This is such a fun idea! Love that they are bite sized and portable. I LOVE this idea. The little bites on the forks are adorable. I mean, I want them ALL for myself, but you know… I could attempt to share. OMG, I LOVE these appetizers! I’ve never seen pasta presented this way before, but it almost looks too pretty to eat! I’d never thought of pasta as an appetizer before, but this looks so fun!